First annual Leasing and Marketing Celebration! Headliner Toni Blake and a panel of industry experts share no-joke sales techniques for real world leasing success. The entire event will celebrate Leasing Professionals in the industry and the work they do daily to keep the properties occupied and running smoothly! This is not a seminar! This is a celebration of leasing with opportunity for interactive, hands-on brainstorming. 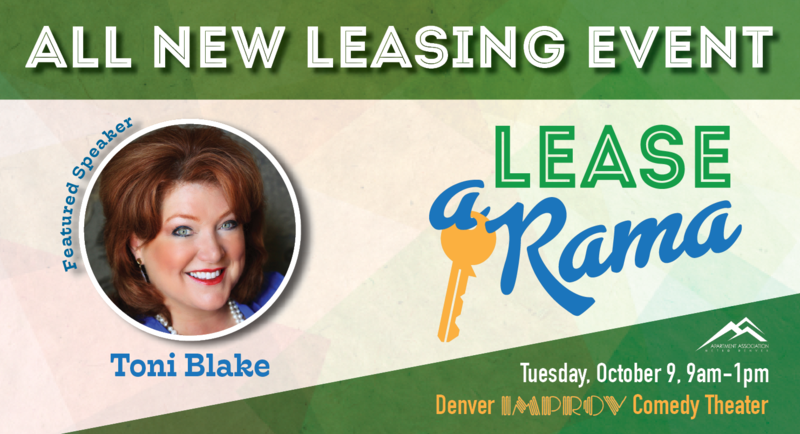 This will be a high energy, fact-filled, trend-savvy, new vision of leasing for 2018/2019 lead by leasing legend Toni Blake and a team of local Lease-A-Rama experts. Attendees will experience TEN Transformation Moments including a brainstorming session with time for discussion, design, exploration, research, and planning. Attendees will leave Lease-A-Rama with takeaways that can be implemented on-site immediately! Leasing professionals are on the front lines daily and the time has come to celebrate them and the work they do! Logo recognition on marketing materials, event signage, event program and Trends.